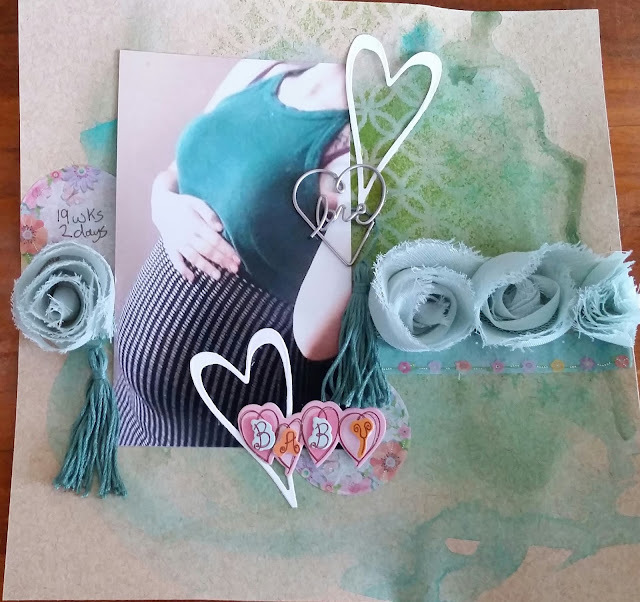 I chose to scrap a belly photo for my daughter's pregnancy album for the Kraft + Challenge so I did a 8x8 layout. I made some tassels in a colour close to her top in the photo. 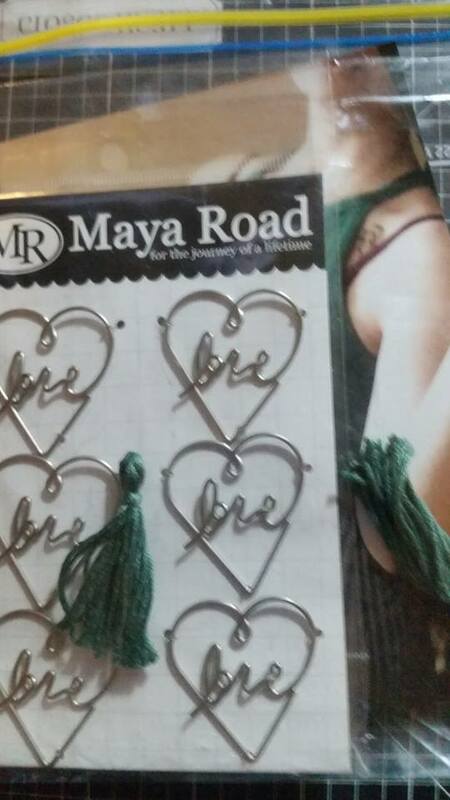 I selected these cute love clips from Maya Road to use with this layout in addition to the tassels. 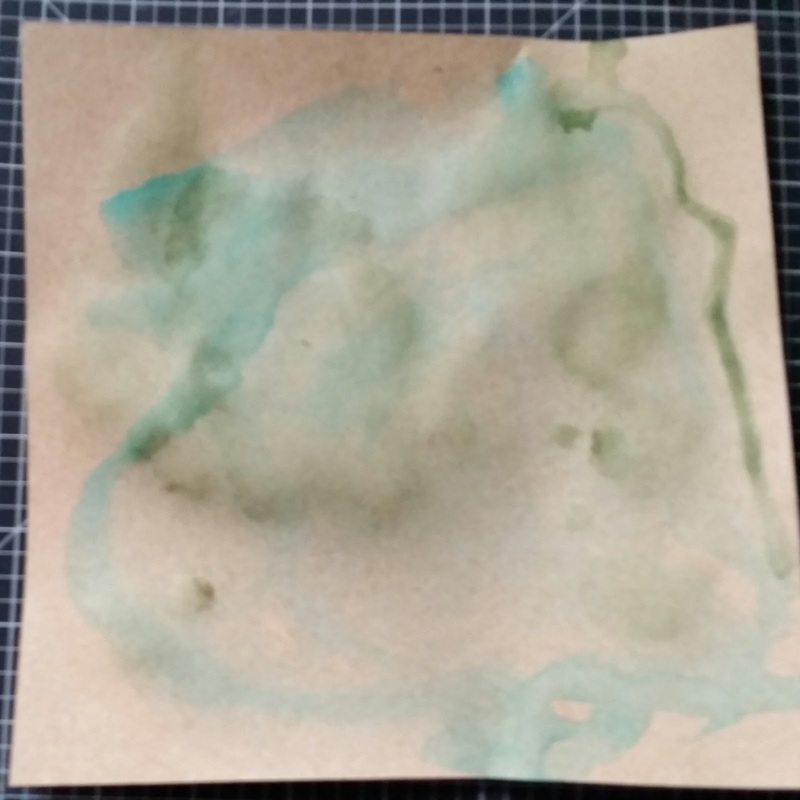 The Kraft paper I am using has a interesting textured look to it so I wanted that to show through any colour I added and chose to not add any gesso or texture paste. 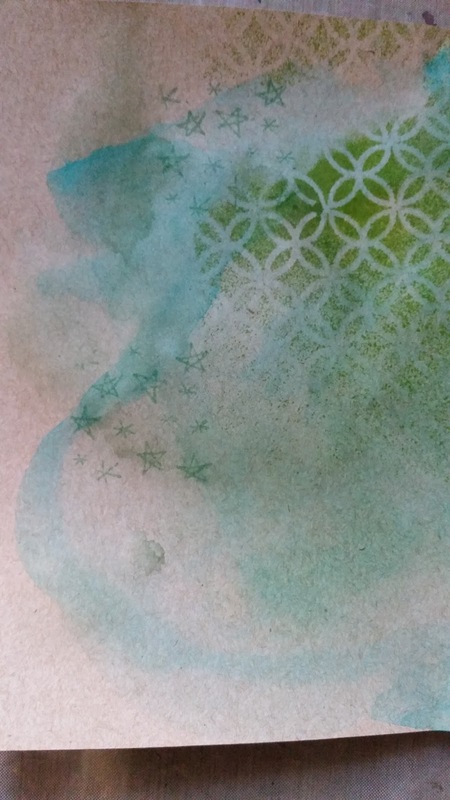 First I added some watercolour in a Emerald shade of green randomly over the page, then I added some left over homemade paint spray made with Kaisercraft sage paint also randomly to the page letting it run and dried with the heat tool. 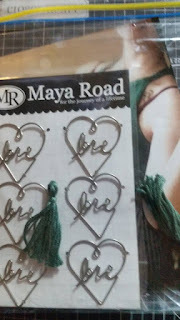 Then I used a Kaisercraft Stencil with Dylusions Dirty Martini Spray. I then added some Cracked Pistacio Distress Ink in with a Blending tool and finally stamped some stars with the Cracked Pistacio Distress Ink. This gave me layers while still showing the Kraft paper off. 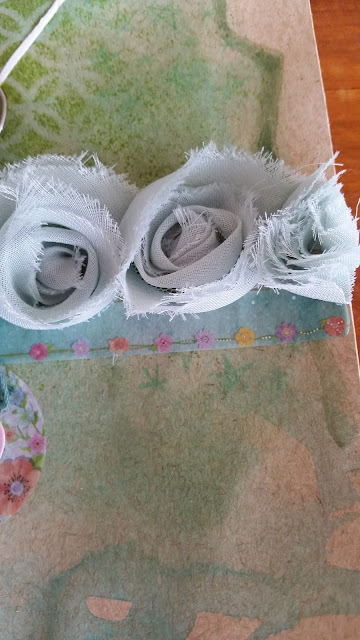 I added 3 vellum stickers I recieved with a Birthday Card from Rebecca at Aussie Crafters and some rose ribbon to the layout for some more layers. I added this cute baby sticker I got at the Destash Marked as it had some of the colours in the flowers on the vellum stickers I was using. In addition to the love clip I added 2 die cut hearts I recieved in a die cut swap. I used one of the vellum stickers to journal how far along my daughter is. I can see why you were so happy! 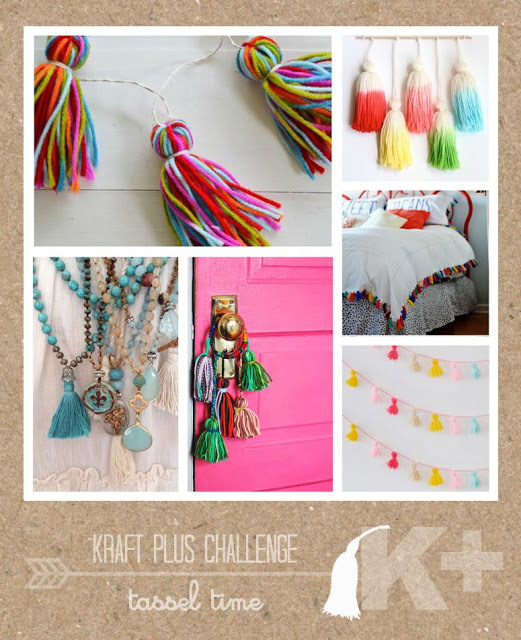 It looks fabulous....such a wonderful journey to document, too:) Those tassles look great & I'm loving those soft flowers, too:) Thanks so much for joining in this month with us at K+!!!! 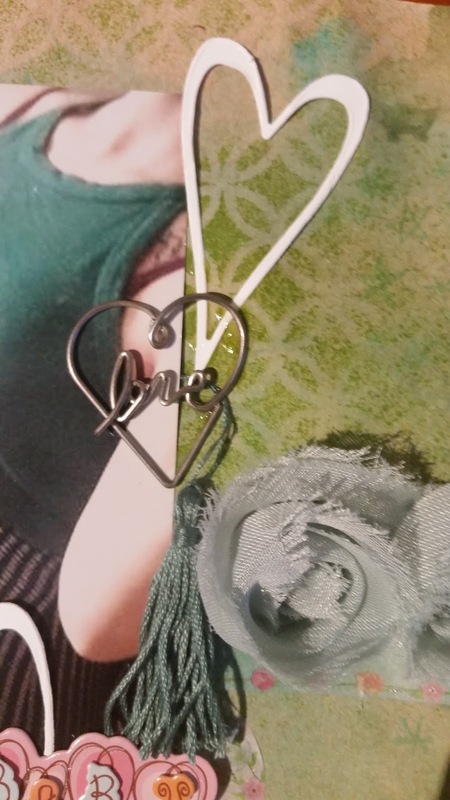 Thank you Janet, thank you for having the Creatively Crafty Link Party. 4 Pocket Letter swaps Mr E did.